Eruptions began on 2 January from the summit of Karymsky and from the lake (Karymsky Lake) within the Akademia Nauk caldera (figure 1), previously considered to be extinct (BGVN 21:01-21:03). Eruptive activity at [Karymsky] continued through the end of April. Figure 1. Schematic map showing some features of the SW part of the Karymsky Volcanic Center. Karymsky Lake lies within the Akademia Nauk Caldera. Courtesy of the Institute of Volcanology. Precursory seismicity. Large tectonic earthquakes in the Kronotsky Gulf have historically been among the precursors to eruptions from Karymsky and Maly Semiachik volcanoes. At 1926 on 31 December 1995, a M 5.6 earthquake occurred in the Kronotsky Gulf (50-60 km NE) at a depth of ~60 km. Earthquake swarms are common beneath the large (50 x 35 km) Karymsky Volcanic Center, but an unusually large swarm started on the evening of 1 January with hypocenters to depths of 80 km (figure 2). These followed a M 5.2 foreshock, and at 2157 a shallow M 6.9 earthquake took place centered ~25 km S of Karymsky; this was the largest earthquake recorded beneath the Kamchatkan volcanoes during the past 50 years. Scientists from the Institute of Volcanology and the Kamchatkan Experimental-Methodical Seismological Department of Geophysical Survey, Russian Academy of Sciences, flew to the epicentral zone of the continuing earthquake swarm and observed the onset of the eruption. Figure 2. Map and cross-sections of epicenters from the earthquake swarm at Karymsky Volcanic Center that began on 1 January 1996. Cross-section A-B (below map) trends approximately NW-SE, and cross-section C-D (left of map) trends approximately NE-SW. Courtesy of the Institute of Volcanology. Early eruptions at Karymsky volcano. On the afternoon of 2 January the eruption began on Karymsky's upper SW flank 50 m below the old summit crater and from the Akademia Nauk caldera lake, ~6 km S (figure 3). Ash and gas clouds from the summit vent fed a plume rising to 1 km above the crater; the ash-flow rate was estimated to be several cubic meters per second. The eruption cloud extended E towards the ocean and ashfall was visible 40-50 km away. Figure 3. Simultaneous eruptions of Karymsky (right) and Akademia Nauk (left) volcanoes, 2 January 1996. Distance between the summit vent of Karymsky and subaqueous vents in the Akademia Nauk caldera lake is 6 km. The Karymsky cone is 700 m high. Courtesy of the Institute of Volcanology. On the evening on 3 January another crater formed on Karymsky; it looked like a 30-m-diameter amphitheater open to the SW. Sub-vertical Vulcanian explosions occurred from this crater to an altitude of 1 km. Over the next few days, explosions sent gas-and-ash emissions 300-1,100 m high almost every minute. During the first three days of the eruption, ~500-800 x 103 tons of solid materials, including ash, lapilli, cinder, and bombs, were ejected at Karymsky. During the next 2-3.5 months ~3-4 x 103 tons of andesite-dacite tephra (SiO2 61%) and a small amount of bombs were ejected. An area with a radius of 15-20 km was covered by an ash layer several millimeters thick. The layer's thickness increased along the ashfall axis, reaching 20-30 mm at 4-5 km from the source. Early eruptions at Akademia Nauk caldera lake. Violent subaqueous explosions on 2 January took place several times every hour in the N part of the 5-km-wide Akademia Nauk caldera lake (figure 4). Explosion clouds rose to 8 km altitude, but most of the tephra fell back into the lake. Ash from Karymsky Lake covered Akademia Nauk volcano and its surroundings. The head of the Karymsky River had its valley and adjacent flood-lands inundated by high water and mud flows. Figure 4. One of the powerful subaqueous explosions from the N part of Karymsky Lake (Akademia Nauk Caldera), 2 January 1996. The base of the growing cloud is ~1 km wide. Courtesy of the Institute of Volcanology. Although the Akademia Nauk caldera lake had been ice-covered during the winter, after the January explosions water temperature reached 25°C, pH decreased from 7.5 to 3.1-3.2, and mineralization increased from 0.1 g/l to 0.9 g/l. Thermal water compositionally similar to those of the Karymsky springs started to discharge at a new shoal in the N part of the lake. According to preliminary estimates, ~0.015 km3 of material was supplied to the lake during the eruption. After the lake water had cleared, a subaqueous deposit around the main explosion vent (with a diameter of 1 km) was observed. The N part of the deposit, ~1 km2, was exposed at the surface, forming an arched spit with the adjoining peninsula (figure 5). According to preliminary estimates, ~5-10 x 106 m3 of tephra including sand and rounded fragments of various sizes, and many bombs, formed the deposit there. Their composition ranged from basaltic andesite to andesite-dacite. The volume of deposits on the bottom of the lake is much greater. Figure 5. View of Karymsky Lake showing the new 1-km-wide peninsula formed by subaqueous explosion deposits on 2 January 1996. The main vents are to the left of the beach arc. Courtesy of the Institute of Volcanology. Activity through April. During the ensuing days in January, the eruption style at Karymsky dropped to 5-6 explosions reaching 500-900 m high every hour. More vigorous single explosions were exceptional. On 13-14 January, a block-lava flow from the flank crater traveled 400 m, was 50-70 m wide, and averaged 6-10 m thick. In late January the interval between explosions started to increase from 30 minutes to 2-3 hours. In February only several explosions were observed each day (figure 6). In late February the number of explosions increased to 5-6/hour, but their intensity decreased. In March the number of explosions decreased but their intensity increased. In April the number of explosions increased. For example, on 23 April they took place every 5 minutes. Two additional lava flows were emitted from the flank crater in April. A dense geodetic network developed since 1972 at the Karymsky Volcanic Center has been measured repeatedly. During the past 20 years, a horizontal extension of Akademia Nauk caldera was observed that may have indicated filling of a magma chamber under the volcano. Measurements made in February and March revealed an extension of 232 cm along the 3.5-km base and subsidence of 70 cm near the area of subaqueous explosions in the caldera lake. Figure 6. Typical Vulcanian and Strombolian activity at Karymsky, January-April 1996. Courtesy of the Institute of Volcanology. Karymsky Volcanic Center. Karymsky and Akademia Nauk are part of the 50 x 35 km Karymsky Volcanic Center (sometimes referred to as the Zhupanovsky volcano-tectonic depression). Located in the Eastern Kamchatka volcanic belt, 30 km from the Kronotsky Gulf and Pacific Ocean, this center contains 21 volcanic edifices, six calderas, and two historically active stratovolcanoes, Karymsky and Maly Semiachik. The 5-km-diameter Karymsky Caldera formed 7,800 years ago and the Karymsky cone has been growing in the center of the caldera for 5,300 years, ejecting andesitic and dacitic materials. Historical reports on Karymsky's eruptions have been available since 1771. During that period of time, more than 20 prolonged eruptions were separated by quiet periods as long as 10 years. The most recent previous eruption continued from 1970 to 1982. Akademia Nauk caldera, which was named by the famous Russian volcanologist Vladimir Vlodavetz in 1939, is located immediately to the S in the SW part of the Karymsky Volcanic Center. Its activity began about 50,000 years ago. The N part of the caldera is occupied by Karymsky Lake (4 km wide, 12.5 km2 in area, and 80 m deep). The Akademia Nauk chloride-sodium springs, with 1.3 g/l mineralization and temperatures >250°C in the interior part of the hydrothermal system, discharge along the lake's S shore. Information Contacts: S.A. Fedotov, V.A. Budhikov, G.A. Karpov, M.A. Maguskin, Ya.D. Muravyev, V.A. Saltykov, and R.A. Shuvalov, Institute of Volcanology, Russian Academy of Sciences, Petropavlovsk-Kamchatsky, 683006, Russia. The Global Volcanism Program has no Weekly Reports available for Akademia Nauk. Periods of seismic unrest have occurred several times in the past 12 months, including one episode in April 1995 (BGVN 19:05), and the volcano usually emits a continuous steam plume. Based on recorded seismic activity, an eruption apparently began during 1700-1900 on 1 January. Russian aviation sources reported an ash plume to 7 km altitude at approximately 1130 the next day. A satellite image at 1400 on 2 January showed that the plume had extended at least 200 km SE and S of the volcano. Several aviation notices (SIGMETs) were issued concerning the ash plume. GMS satellite imagery revealed multiple ash emissions on 2 January, with the cloud height estimated at ~7 km. Satellite data on 3 January continued to show multiple low-level (below 5,400 m) ash bursts of short duration that drifted S and dissipated within an hour. When the volcano was visited by Vladimir Kirianov and Yuri Doubik of the Institute of Volcanic Geology and Geochemistry between 1330 and 1630 on 3 January, they discovered that the initial eruption had vented from the N end of Karymsky Lake. The lake occupies the 5-km-diameter late-Pleistocene Akademia Nauk caldera, ~5 km S of Karymsky volcano proper. However, by the time of their visit activity had shifted to Karymsky volcano where a new crater had formed on the SSW side of the summit, adjacent to the old crater. The new crater, approximately the same size as the old crater, produced explosions every 1-5 minutes that fed a thick black ash plume to an altitude of ~2.5 km moving E. Fresh ashfall was widespread throughout the 5-km-wide Karymsky caldera and for a considerable area to the E and N. Karymsky Lake was yellow-gray in color and mostly covered by steam and vapor. The Karymsky River, which drains the lake to the N, was completely buried in ash and no longer visible; a new beach with numerous fumaroles marked the former source of the river. Very strong seismic activity associated with the eruption included one M 6.5 earthquake on the first day of the eruption. Seismic stations as far as 110 km from the volcano recorded the activity. By 5 January the new summit crater was over twice the size of the old crater. A thick black ash plume had been observed the previous two days erupting explosively from the new crater to altitudes ranging of 2,400-5,500 m. Seismicity on 6 January indicated continued explosions every 1-3 minutes. Karymsky Lake remained yellow-gray and covered by steam and vapor. Seismicity through 12 January was interpreted to reflect continued, but less explosive, eruptive activity. Karymsky, ~110 km NW of Petropavlovsk-Kamchatsky, is the most active volcano of eastern Kamchatka. The latest eruptive period began ~500 years ago; much of the cone is mantled by lava flows less than 200 years old. It has been quiescent since frequent eruptive activity during 1970-82. The volcano is capable of explosive eruptions which can send ash to over 10 km and continue sporadically for days or weeks; short lava flows are also common. Information Contacts: Tom Miller, Alaska Volcano Observatory (AVO), a cooperative program of a) U.S. Geological Survey, 4200 University Drive, Anchorage, AK 99508-4667, USA, b) Geophysical Institute, University of Alaska, PO Box 757320, Fairbanks, AK 99775-7320, USA, and c) Alaska Division of Geological & Geophysical Surveys, 794 University Ave., Suite 200, Fairbanks, AK 99709, USA; Vladimir Kirianov and Yuri Doubik, Institute of Volcanic Geology and Geochemistry, Piip Ave. 9, Petropavlovsk-Kamchatsky, 683006, Russia; NOAA/NESDIS Synoptic Analysis Branch (SAB) , Room 401, 5200 Auth Road, Camp Springs, MD 20746, USA. According to the Institute of Volcanology (IV), the eruption on 2 January (BGVN 21:01) began around 0800. This activity was preceded by an upsurge in seismicity that started in April 1995. At 1926 on 31 December 1995, a M 5.8 earthquake occurred in the Kronotsky gulf, 50-60 km NE of the volcano. On 1 January at 2057 an earthquake of M 5.2 in the Karymsky region was followed at 2157 by a M 6.9 event centered ~25 km S of the volcano. During the next day there were more than 10 aftershocks of M >= 5.0. On 2 January at 1540, a group of IV volcanologists arrived by helicopter. Eruptive centers were observed near the summit and 5-6 km S in Karymsky Lake (maximum depth 115 m), which fills the Akademii Nauk caldera. The eruption began with formation of a vent with a diameter of 20-30 m, located 50 m below the summit. Violent emissions of ash-rich gas jets rose to 1 km from another vent on the SW slope. Steam-and-gas jets, occasionally with black-colored matter, were also ejected to several hundred meters from beneath the surface of Karymsky Lake. The presumed eruptive center was 100-200 m from the shore in the NW sector of the lake. Turbulent steam-and-gas plumes rose 5-6 km above the surface from a 200-m-diameter area. Ice covering the lake had completely melted. On 3 January the near-summit vent increased in size to 50 m in diameter. Gas and steam blasts alternated with ash ejections from the two simultaneously active vents on the volcano. Ash was usually ejected from the upper vent, and a white-colored plume was emitted from the lower vent. Ash ejections lasted 2-3 minutes, and gas blasts lasted 1.5-2 minutes. An ash-and-gas column rose 1-1.2 km and was blown E and SE by the wind. The surface of Karymsky Lake steamed intensely, sending clouds 800-1,000 m above the lake. Areas of green water were visible through breaks in the clouds, and a newly-formed black beach was seen. In the N and NE sector of the lake a narrow spit, beginning from the source of the Karymsky river and extending 250-300 m to the center of the lake, had formed. The water level in the lake had dropped a few meters. The upper reaches of the river had dried up, but on 2 January waves from the submarine eruption (up to 10 m high or more) overflowed the N shore, flooding a wide valley 1.5 km below the source. During a surveillance flight on 4 January, large areas of the valley were covered by black mud. The beach contained three fumarolic vents along the NE-trending fault zone. Within a radius of 500-800 m of the source of the Karymsky River, the surrounding snow-covered hills contained thousands of holes with diameters ranging from 10 cm to 1.5-2 m formed by lithic blocks ejected from the lake. The water level of the lake continued to fall because of intense evaporation. Light-gray dacitic ash covered an area of about 150-200 km2. At a distance of 8 km from the volcano fractions ranging from 0.16 to 0.06 mm dominated. Estimates made by S.A. Fedotov indicated that on 2 and 3 January the ash ejection rate from the summit crater reached 3-4 tons/second. Routine observations from 2 January through 11 February showed that the climactic phase of the subaqueous eruption continued for no more than 12-15 hours. That eruption consisted of frequent explosions during which a vapor-gas mixture with lithic material was ejected to the surface. In the N sector of the lake at the shore W of the Karymsky River, damaged trees provided evidence of two eruptive sources 500-600 m from each other. This zone contained the main concentration of bomb material ejected from the lake. A portion of the shoreline (150-200 m long and 5-15 m wide) E of the river sank several meters into the lake. The main eruption center was 500 m from the shore, but smaller peripheral centers were also observed. As a result of the eruption, in the NNW sector of the lake, a beach in the form of a wide 0.4 km2 cape was produced, as well as a narrow spit extending SE from the old shore. The length of the new shoreline was 2.4 km, and a large shoal was observed around the new peninsula. According to the preliminary estimates, the ejected deposits in the lake are at least 1 km2 in area and 5-10 x 106 m3 in volume. Thermal springs that discharge at the S shore of Karymsky Lake were destroyed by ejecta from this eruption, and several new mud pots were formed; chemical composition of the solutions was unchanged. Near the center of the new beach, composed of sand-gravel and bomb material, a chain of five explosive vents with diameters from 1.5 to 30 m was observed. At the N end was a thermal site with a diameter of ~50 m that exhibited intense vapor emission and was covered by sublimates; visiting scientists detected a hydrogen sulfide odor. A dry funnel with a diameter of ~3 m and high gas emission at a temperature of 97°C was in the center of this site. Other explosion funnels had water at a depth of 1.2-1.5 m with temperatures from 33 to 70°C. The three funnels closest to the lake and on the opposite shore had gas emissions with temperatures of 97-98°C. On 4 January run-off from the lake ceased owing to damming by ejected material. Analyses of water samples from the lake, river, and various hot springs in the area indicated that there had been chemical contributions to the lake water by an underlying magma body. Information Contacts: G.A. Karpov, Ya.D. Muravyev, R.A. Shuvalov, S.M. Fazlullin, and V.N. Chebrov, Institute of Volcanology, Far East Division, Russian Academy of Sciences, Petropavlovsk-Kamchatsky, 683006, Russia. The scenic lake-filled Akademia Nauk caldera is one of three volcanoes constructed within the mid-Pleistocene, 15-km-wide Polovinka caldera. Beliankin stratovolcano, in the SW part of Polovinka caldera, is eroded, but has been active in postglacial time (Sviatlovsky, 1959). Two nested calderas, 5 x 4 km Odnoboky and 3 x 5 km Akademia Nauk (also known as Karymsky Lake or Academii Nauk), were formed during the late Pleistocene, the latter about 30,000 years ago. Eruptive products varied from initial basaltic-andesite lava flows to late-stage rhyodacitic lava domes. Two maars, Akademia Nauk and Karymsky, subsequently formed at the southern and northern margins of the caldera lake, respectively. The northern maar, Karymsky, erupted about 6500 radiocarbon years ago and formed a small bay. The first historical eruption from Akademia Nauk did not take place until January 2, 1996, when a brief, day-long explosive eruption of unusual basaltic and rhyolitic composition occurred from vents beneath the NNW part of the caldera lake near Karymsky maar. Braitseva O A, 1998. Phreatomagmatic eruption in Lake Karymskoe (East Kamchatka) ~6500 14C years B.P. and Holocene episodes of basalt magma injection under the Karymsky area. Volc Seism, 19: 685-692 (English translation). Fazlullin S M, Ushakov S V, Shuvalov R A, Aoki M, Nikolaeva A G, Lupikina E G, 2000. 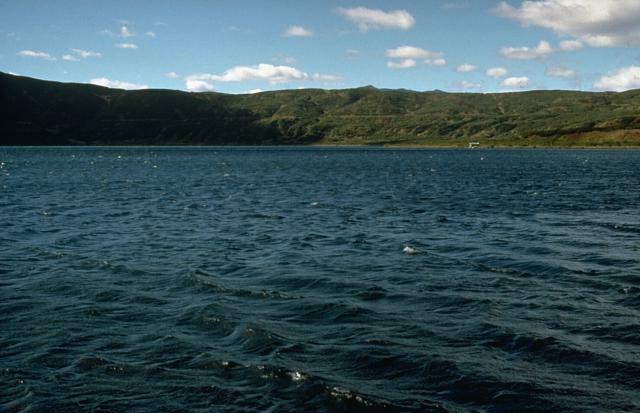 The 1996 subaqueous eruption at Academii Nauk volcano (Kamchatka) and its effects on Karymsky lake. J. Volcanol. Geotherm. Res., 97: 181-193. Fedotov S A, 1998. Study and mechanism of the simultaneous 1996 Karymsky volcano and Akademii Nauk caldera eruptions in Kamchatka. Volc Seism, 19: 525-566 (English translation). Muraviev Y D, Fedotov S A, Budnikov V A, Ozerov A Y, Maguskin M A, Dvigalo V N, Andreev V I, Ivanov V V, Kartasheva I A, Markov I A, 1998. Volcanic activity in the Karymsky center in 1996: summit eruption at Karymsky and phreatomagmatic eruption in the Akademii Nauk caldera. Volc Seism, 19: 567-604 (English translation). Ushakov S V, Fazlullin S M, 1998. Morphometric characteristics of Lake Karymskoe after an underwater eruption. Volc Seism, 19: 675-683 (English translation). Vakin E A, Pilipenko G F, 1998. Hydrothermal activity in Lake Karymskoe after the 1996 underwater eruption. Volc Seism, 19: 737-767 (English translation). Vlodavetz V I, 1947. The volcanoes of the Karymsky Group. Acad Sci USSR Trans Kamchatka Volc Station, 3: 47 (in Russian with English abs). There is no Deformation History data available for Akademia Nauk. There is no Emissions History data available for Akademia Nauk. Lake-filled Akademia Nauk caldera (also known as Karymsky Lake) was formed during the late Pleistocene. The 3 x 5 km caldera truncates an earlier caldera. The caldera was active during the Holocene, and low-temperature geothermal activity took place along the shores of the caldera lake, but no historical eruptions occurred prior to 1996. 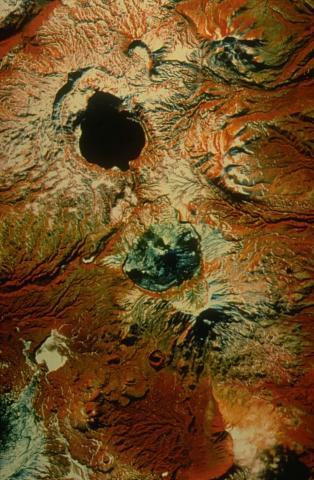 This false-color satellite image shows many calderas of the Zhupanovsky (Karymsky) volcano-tectonic depression. Lake-filled Akademia Nauk caldera (bottom) truncates the older Odnoboky caldera, whose rim is seen south of the lake. Both these calderas were constructed within the larger mid-Pleistocene Polovinka caldera, whose rim appears at the lower right. The dark area in the center is the frequently active Karymsky volcano, whose lavas fill an early Holocene caldera. The light-colored area immediately to its north is Dvor caldera. Photo courtesy Dan Miller (U.S. Geological Survey). 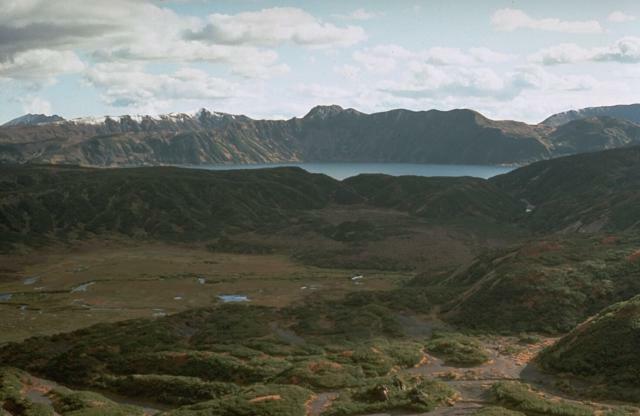 The scenic lake-filled Akademia Nauk caldera, seen here from the north with Kaymsky volcano in the foreground, is one of three volcanoes constructed within a large mid-Pleistocene caldera. Two nested calderas, 5 x 4 km Odnoboky and 3 x 5 km Akademia Nauk (also known as Karymsky Lake), were formed during the late-Pleistocene. 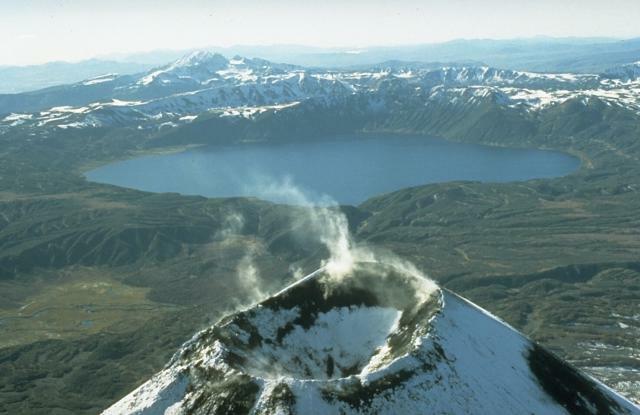 The first historical eruption from Akademia Nauk did not take place until January 2, 1996, when a brief, day-long explosive eruption occurred from vents beneath the NNW part of the caldera lake. There are no samples for Akademia Nauk in the Smithsonian's NMNH Department of Mineral Sciences Rock and Ore collection. Large Eruptions of Akademia Nauk Information about large Quaternary eruptions (VEI >= 4) is cataloged in the Large Magnitude Explosive Volcanic Eruptions (LaMEVE) database of the Volcano Global Risk Identification and Analysis Project (VOGRIPA).